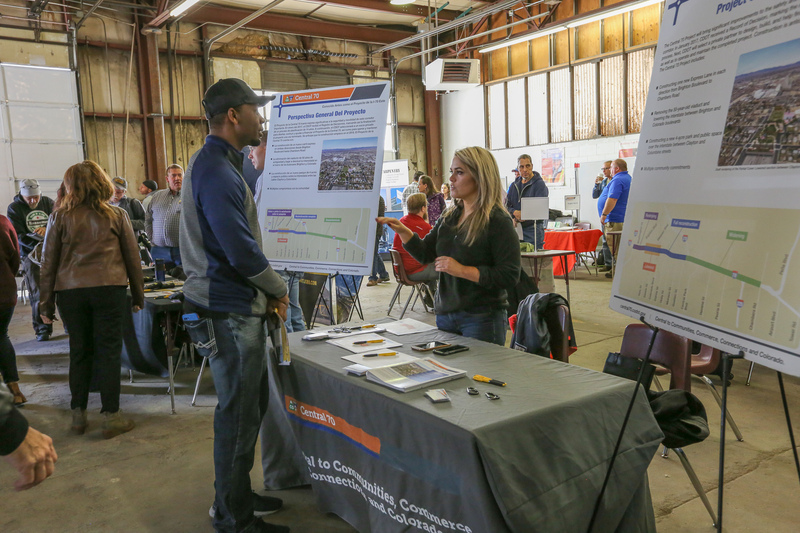 Job seekers in the Denver metro area gathered to get connected with high-paying jobs in the construction industry. 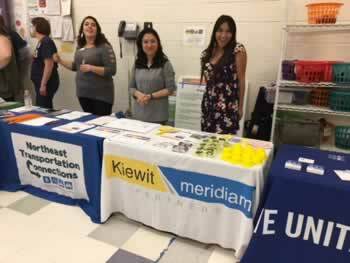 Kiewit Infrastructure, local signatory unions, subcontractors and WORKNOW (an alliance of organizations that integrate construction industry job training and community resources), participated in a Central 70 Job Fair on Nov. 3, 2018. 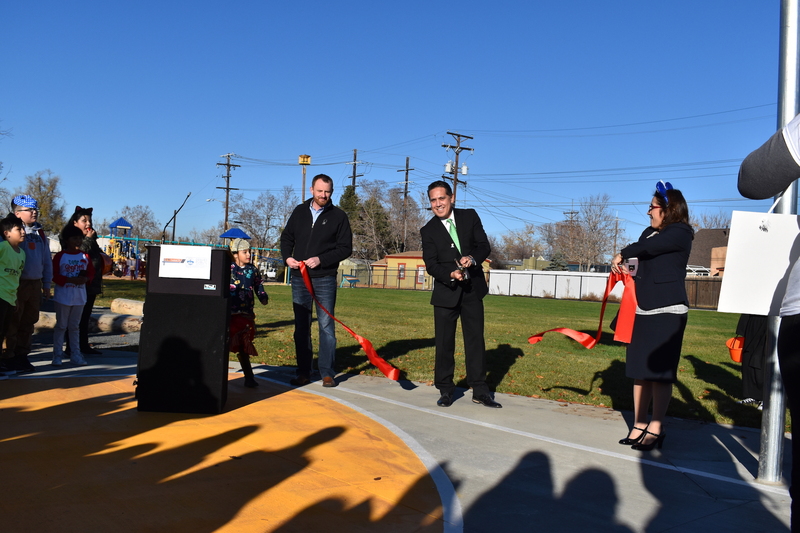 On Oct. 31, 2018, Denver Public Schools (DPS), in partnership with the Colorado Department of Transportation’s (CDOT) Central 70 Project, held a ribbon-cutting ceremony for the relocated and improved Swansea Elementary School playground. The Denver Police Department hosted the annual National Night Out on Tuesday, Aug. 7, 2018 at Falcon Park in Montbello. The Central 70 Project team was able to enjoy a warm day with community members. Members from the Central 70 Project were able to run alongside community members in the Adelante 5K Race on Sunday, Aug. 5, 2018. Runners were joined by Councilman Albus Brooks and the other members of the community in this great event to support this important organization in Elyria Swansea Globeville neighborhood! 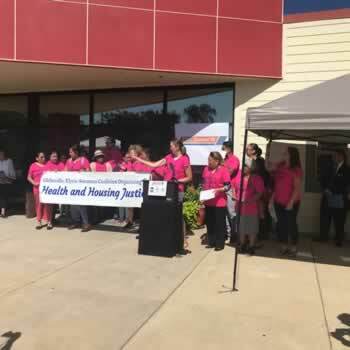 The Central 70 Project team helped present the Affordable Housing Grant at Focus Points on Monday, July 30, 2018. The annual Resource Fair at Focus Points Family Resource Center on Friday, July 13, 2018 was filled with plenty of helpful information for community members on upcoming summer construction. 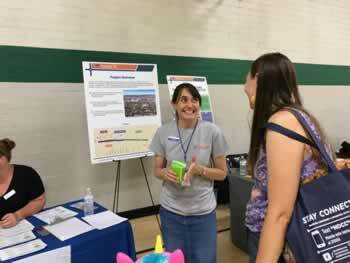 On Saturday, June 23, 2018 the North Denver Cornerstone Collaborative Open House started off with an exciting Open House that drew people from different areas. 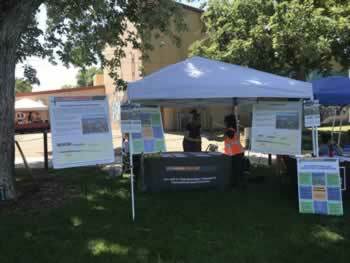 Central 70 team members were able to provide information on upcoming summer construction. The Central 70 Project team joined in the festivities at the Montbello Recreation Center on Saturday, June 2, 2018 and provided information on upcoming construction this summer. The Central 70 Project team attended the Garden Place Spring Carnival on Friday, May 18, 2018. On Saturday, May 12, 2018 the Central 70 Project team joined community partners to participate in the annual Swansea Elementary School Carnival. Team members provided information on the Project and upcoming construction this summer. 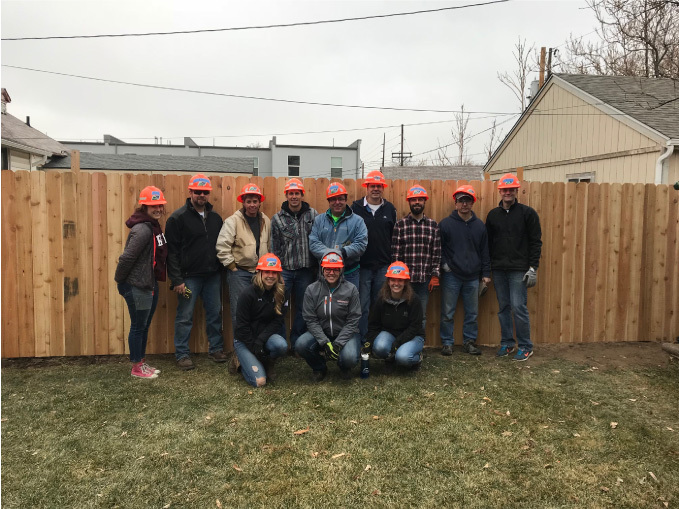 The Central 70 team volunteered for Habitat for Humanity on Feb. 9, 2018. Working on two separate homes in the Globeville/Swansea community, the team built a fence (pictured), painted trim on the homes and installed a gate. It was truly a pleasure to volunteer with a group that makes such a positive impact on the community every day. Questions about the Project? Join the project team at Chips and Chat. Central 70 hosts Chips & Chat for the community on the second Tuesday of each month. 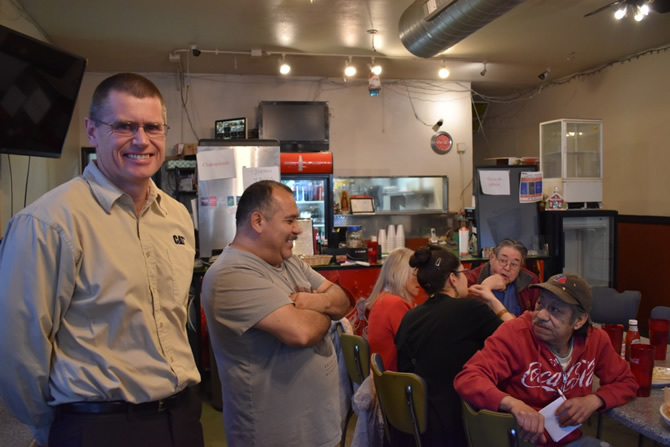 Join us anytime between 4:30 - 5:30 p.m. at Tacos El Huequito to speak directly with project team members and ask questions about Central 70. On Saturday, May 20, 2017 the Central 70 Project team joined community partners to attend the annual Swansea Elementary School Carnival. The team conducted hourly drawings to give away 11 bikes to local children. 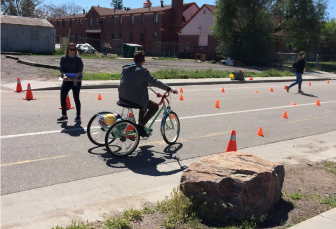 Thank you to the Northeast Transportation Center (NETC) and Xcel Energy for your donation of bikes and helmets, and assistance with traffic control on the day of the event. 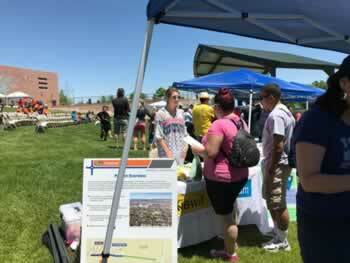 Representatives with Denver Environmental Health (DEH) and the Colorado Department of Public Health and Environment (CDPHE) were also there to showcase the Swansea Air Monitoring System (or SAM) and share air quality levels with the community. This system is currently monitoring the air quality and will continue doing so until a year after the Central 70 project construction is complete. See a summary of the air quality index around the state. Central 70 Communications Manager Rebecca White talks about the project with the LoDo Rotary, one of many rotary presentations this fall. The Central 70 team joined in the festivities and provided information on the project at the Holy Rosary Church Festival over the 2016 Labor Day weekend. Central 70 representatives provided information to a full crowd on a beautiful day at the Polish Food Festival, sponsored by the St. Joseph's Polish Church. 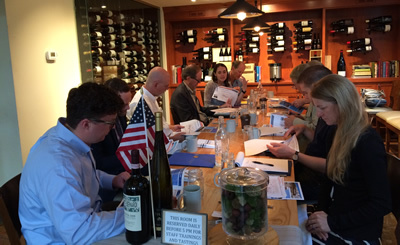 The Central 70 team met with local businesses along 46th Avenue to discuss construction impacts and small business certification. 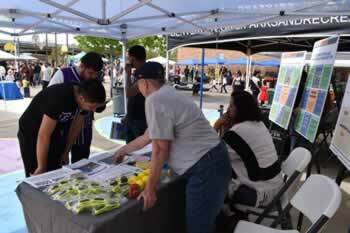 The team had an information table at the event and answered a variety of questions from the community. Everyone had a chance to vote on their favorite options for the playground and splash park that will be part of the project. Project Manager Tony DeVito presented information on the project to a packed house of Denver Chamber of Commerce members.